One of the reasons few people outside of Spain have heard of, or at least drunk, Verdejo is that up until 30 or 40 years ago it was just too much of a pain in the arse to make into a fresh, dry, white wine. I think most Verdejo producers today would appreciate me saying that fact. Mostly cos it highlights how much work they put in to produce the modern style. The biggest issue with Verdejo as a grape, or I suppose as grape juice, is that it’s really susceptible to oxidisation. You know like when you cut an apple, and after a couple of minutes it goes brown? Well that’s oxidisation. So back to Verdejo, in the past the techniques weren’t there to stop the oxidisation, so they just made a sherry-like drink from it. Fast forward to the 1970s when pioneers from Rioja and France decided to try something new. They used anaerobic winemaking techniques (anyone remember their GCSE biology? Means oxygen free! 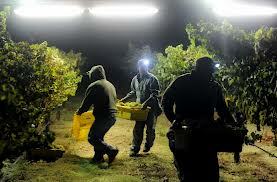 ), they harvested the grapes at night when it was cooler, and managed to keep the aromatics and the acidity for long enough to produce some really cracking dry, white wine. The potential of Verdejo was realised, and before long the DO (national classification system) of Rueda was born (think 1980, something like that) to recognise white wines made from Verdejo (or at least Verdejo heavy blends). This was an interesting history. I only know the history of the picture which a labourers who travel from all over Spain to pick up the grapes in “la vendimia”, had a friend that went there last year. Loooooong hours and hard labour for sure. But interesting history about the wine. Harvest time ain’t easy, that’s sure! By the way, I know they have to work fast. But what if they don´t work as fast, the grape does go bad if they don´t pick it up in 20 something days. I know this guys spend almost a month there so I was guessing that maybe that´s the aloted time to pick them up or they go bad. The grapes are usually picked in batches, sometimes it’s not happening to pick them all in one day/night. The important thing is to get the grapes in when it’s cool, and straight into the sealed (and cooled) holding/fermentation tanks. But speed is pretty important. Winemakers tend to work 14/15 hour days, 7 days a week, all the way through harvest to get the grapes in as quick as possible. Where did my mind go…..no it he went to France! to the south of France to pick up the grapes. I got it mix up since here the guys that go there they just say “I´m going north this year” and since North to Madrid is Rioja out went my mind thinking now that it was there. About the schedule I did have an idea how long these guys worked. They even told me to go with a guy I know, and I said screw that. But for us, and this guy I know it seems its quite good money. It’s funny how shortly after the new style was introduced (fresh and crisp) it took on characteristics inherently “sauvignon blanc” like. Now in Rueda, there is a ton of sauvignon blanc planted alongside the verdejo and DO rules allow something like 50% in blends! Absolutely, up to the consumer to make Verdejo production worth it by drinking it. Think to call it DO Verdejo Rueda it needs 85% in the blend, but you’re right, just DO Rueda is 50%.